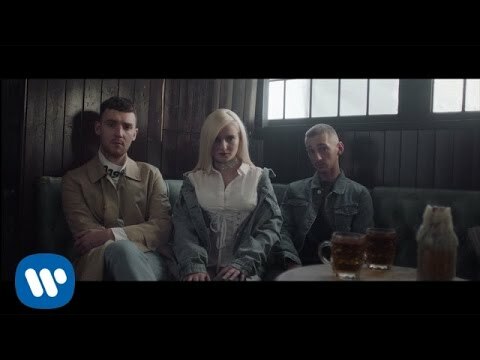 "Rockabye" is a song by British electronic group Clean Bandit, featuring English singer Anne-Marie as main vocalist together with Jamaican dancehall singer Sean Paul. It was released on 21 October 2016 and was their first single since Neil Amin-Smith's departure from the group and it serves as the second single from their upcoming second studio album. The song is about hardships of single mothers and alludes to the nursery rhyme, Rock-a-bye Baby. "Rockabye" is included on the deluxe edition of Marie's debut studio album, Speak Your Mind. The song became the UK Christmas number one for 2016 on 23 December 2016. It is the first song in chart history to become Christmas number one after already being at the top of the charts for six weeks. In total, the song spent 9 weeks at the summit of the UK Singles Chart while also topping the charts in over 20 other countries. "Rockabye" was written by Jack Patterson and Norwegian singer Ina Wroldsen. Wroldsen wrote the lyrics about her son, which, according to Grace Chatto, "is why it rings so true for and is so emotional and special." Clean Bandit announced the single on 21 October 2016, just two days after Neil Amin-Smith quit the band. Talking to Digital Spy, Chatto said, "We've wanted to work with Sean Paul for a long, long while and it's a dream that we've managed to finally do it. Anne-Marie tells the story and we love her voice. We first heard her singing with Rudimental and we've met her at a million festivals over the past couple of years – it's been so lovely to collaborate together." "Rockabye" is written in the key of A minor. It was composed in common time with a tempo of 102 beats per minute, and follows a chord progression of Am–F–G–Em. The vocals span from G3 to E5. The video for the song was released on 21 October 2016, and has a running time of 4 minutes and 13 seconds. Parts of it were shot on location in Cap Sa Sal, Begur, Spain and the George Tavern, London. The video has over 1.8 billion views on YouTube as of May 2018, making it the 30th most viewed video on the site.